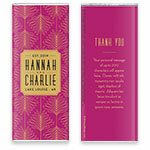 A stunning Art Deco-inspired leaf pattern creates a vibrant backdrop on this elegant wedding chocolate bar design. 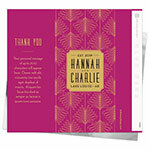 Note: This design contains faux metallic effects to imitate the look of metallic ink or foil. Design: An Art Deco leaf pattern on a jewel-toned background. Personalization: Front names and message with a back message.